If Wasteland 2, Divinity: Original Sin and Pillars of Eternity didn't sate your old-school RPG appetite, then, luckily for you, there's still Torment: Tides of Numenera to come. Also you might want to get that insatiable hunger looked at. See a doctor, or something. 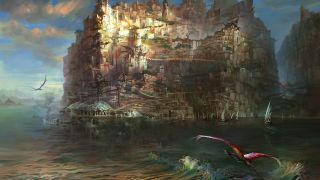 InXile's Planescape successor is still in development, but you can get an early peek at some of its locations via this new trailer. It explores the Ninth World in which the game is set. And before you ask, no. You won't need to have seen worlds one through eight for it to make sense. Away from Torment, InXile are gearing up for A Bard's Tale IV. Andy Chalk recently spoke to Brian Fargo about the studio's past, present and future projects in the wake of their third Kickstarter.